So I probably spend way more in thrift stores than is reasonable. But I guess If I am going to buy things I don’t need, it’s better to spend $3.99 on them than say $39.99. I recently hit the Goodwill in Berry Hill, producer of the awesome Blowfish boots. A few weeks ago, Talks to Owls and I were hiking and I was wearing my favorite Converse One Star camp shirt (I have two actually, one in grey and one in purple, I think I was wearing the purple one) to keep the sun off, because I’d rather wear long sleeves than sunscreen. I was lamenting my choice and saying I needed to hit a thrift store or two and get some light cotton, WHITE button up shirts for my summer sun screen use. Guess what the Goodwill turned up yesterday? My exact Converse shirt, in my size, in white, looking as if had never been worn (and perhaps it hadn’t there was a bunch of other Target stuff there that still had the original tags in it) for $3.99. Some days you just can’t lose. Unless of course after going through all the shirts, you hit up the misc. section and start looking through framed pics for your walls. 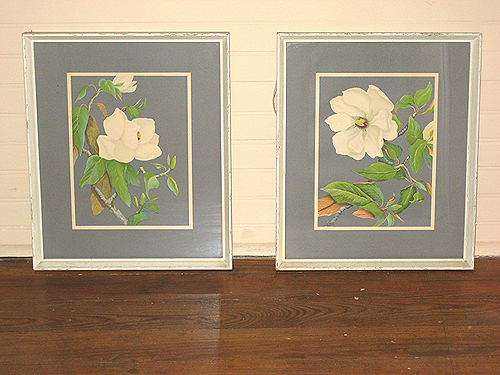 Sure I found a great pair of 30s-ish, Grandma looking prints of magnolias to put up in my kitchen (pictured above), but am I the only person who could possibly buy the exact same piece of art in two separate thrift stores? Yep, the long rectangular, colorful bird picture above the dresser in this pic? I bought another one of those. In my defense I studied it for a long time to determine if it was the same picture, or if was similar but with different birds (which would have been AWESOME). Alas, it’s the same. So, uh, if anyone shares my interests in art that looks like your grandmother would have hung, let me know. First commenter genuinely interested in it, gets it (and yep, it’s framed identically and everything). 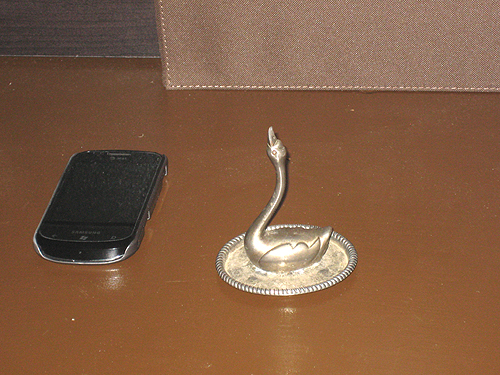 It’s a swan thing for, I guess, holding your rings when you taken them off? Never mind that I already have an item specifically for this purpose, but look at it! It’s a swan! I’m trying to imagine some way I can use it to hold sewing notions or something. Categories: ain't nothin' much, craftygirl, nifty thrifty | Permalink.